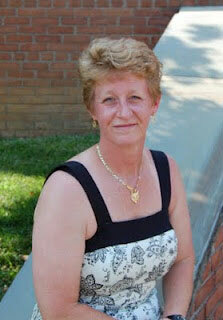 Today is my first author interview on my blog. I’m very excited to have had a chance to work with Stacy Eaton, author of the My Blood Runs Blue series. Stacy hosted me on her blog last Wednesday, and I’m really happy she agreed to be a part of my blog this week. Q: Did you go the traditional route with publishing or did you self-publish? How was that process? A: When I wrote my first book, My Blood Runs Blue, I had no clue what I was going to do when I finished it. About half way through, I started doing research and came across Outskirts Press, Inc. It sounded like a good thing, so I jumped on board. They walked me through then entire process from signing up to editing to graphics to rewrites! It was an easy process to work with them. Q: What are your thoughts on the self-publishing route vs. traditional publishing? A: Personally, I prefer to self-publish. I am 100% a control freak, so thinking about allowing someone to have control of my writing scares the crap out of me. Besides, I work hard to do the work and the marketing, why should someone else get part of my money? These days the traditional publishing company’s expect the authors to do a lot of the marketing themselves. I already am. Someday my thoughts might change, but for now, I’ll stay in the Self-Publishing industry. Q: Did you always want to be an author? How long have you been writing? A: It was not until October of 2010 that I had even thought of writing anything. I got an idea, sat down and started writing. I surprised myself when I completed it nine weeks later and already had the second in the series plotting deep in my mind. I look at it this way: I got bit by a bug, a really big bug, and I don’t want the cure to the bite! I love writing and look forward to doing much more. Q: Do you have any special routine you follow when writing? Are you superstitious about it? when I can. When I do write, I write fast and I write deep. The only thing that I must do is have music on. I can’t write without background noise, it just doesn’t work. Q: What inspires you or gets you into the mood to write? What gives you your ideas? A: My ideas come from all over. The ideas for My Blood Runs Blue came from working late one night at seeing something in the woods. My love of the paranormal helped the idea bloom and I was off without a second thought. Most of the other ideas are from life. I’m a police officer, so I see quite a bit of the good and bad of people. I see situations that many would never care to see and some of those inspire me to write about them – not exactly – but they give me the ideas. Right now I am in the process of edits and re-writes with a new book called Whether I’ll Live or Die. This book is about domestic violence. Q: What inspired your Blood Runs Blue series? There are a lot of vampire tales and books being published right now. What makes yours stand out? A: One night while I was working, I was standing outside of my car, stretching just enjoying the fresh night air. In the tree line where I stood, I saw eyes looking back at me. We stared at each other for a while and then the eyes just disappeared. I am an avid reader of Paranormal books and being a quiet night I got back in my car and started patrolling my area. I wondered if I was in trouble out there doing my duties if a vampire would come to my rescue and help me. The idea was born and it grew quickly. Because of the job I do, I put a lot of law enforcement into my stories. I move through typical calls that we deal with and the vampires in my novels are not the dark sinister ones you read about that brood over what life has given to them. They live lives that are full and have a purpose and they believe in humanity. The series is deep in mystery and suspense along with some major twists and turns and throwing in some adult romance gives it a nice round about feeling. Q: Your “About Me” section on your web site says that you’re a full time police officer. How much does that help you in what you write? A: It is huge! All the books that I have written or am writing are set in the law enforcement world. 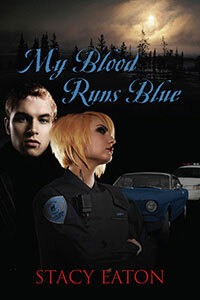 Of course my My Blood Runs Blue series is about police and vampires, but like I mentioned earlier, I am just finishing Whether I’ll Live or Die which is about a girl who deals with domestic violence first hand and a police officer who deals with it in the law. I also have a contemporary romance novel that is again set in my profession along with a series I am writing with another author that deals with addictions. It is very easy to write a book when you know and love what you are writing about. Bringing in the police work just fits with me. Q: Your bio says you live in Pennsylvania. Is what you write set in a similar city/region? A: The series does take place in an area similar to where I live and work. Of course all the names are changed, but people that know the area have told me they knew exactly where I was talking about when they read my book. Q: Where did you always dream of living? Why? A: If I could live anywhere, it would be in the Caribbean. I love the ocean, and I love warm temperatures. I am not a snow person at all. I would love to have a home that overlooked the ocean. I could imagine myself sitting on the veranda writing while the soft breezes blew around me. Q: What other hobbies do you have/things do you like to do besides writing? A: I love photography and have been doing that since I was in high school. A long time ago, I had my own dark room and did my own black and white processing. Now in this digital age, I enjoy it almost as much because I can take so many more photographs! About 12 years ago, I took karate when my son was young. We actually took it together. Now my daughter is taking it and I have been thinking about getting back into it. Watching her I have realized how much I missed it. Other than that, my quiet time is spent reading, writing, spending time with my family and playing with my two Shiloh Shepherds. Thank you so much Brittany for having me here today! I very much enjoyed joining you and your readers today. Thank you Brittany for hosting me today!!!! Excited to be here!